Here I will discuss how this project originally began and how it’s progressed so far. I might update this as I go on. It began in late 2015 (I can’t remember the specific date. It was probably close to this time of the year, actually) when a friend of mine asked if I wanted to make a game with him, since I’d been talking about Mega Man games and what I’d put into it with the characters I’d created beforehand. 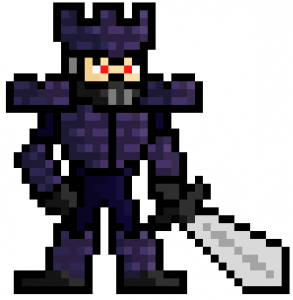 We began the development, I did a few sprites, he started making the game engine. I don’t remember what he used, but I’ll ask him some time and put a note in here somewhere. So, this was how the development team began, with me being the artist/writer/sound guy and him being the coder. That went on for a few weeks, and we were making slow progress. He had started with jump arcs and collision and I’d gotten my girlfriend at the time to join the project. The concepts were still brewing and ideas were coming out of everywhere. 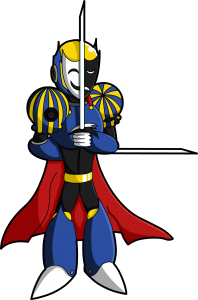 We had a Robot Master line already, and it was the DJN line, created by the Dr. Junipers (There were two, they were married). DJN 001-004 were Hydro Woman, Cobra Man, Race Man and Vine Man, and they were made by my girlfriend and DJN 005-008 were Split Man, Temp Man, Disco Man and Castle Man, who were created by me. In the story, we said the first four were made long before the others by the female Dr. Juniper, while mine were made by her budding scientist husband. From the very beginning I wanted to separate this from the Mega Man canon as much as possible. I don’t really like using things from the main series, mostly because I’m worried I’ll misrepresent them. The story of the game centred around the internal conflict of leadership between Split Man and Castle Man, who were made to be mortal enemies due to their differences as leaders. 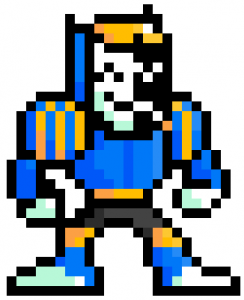 Castle Man was made to be the main villain of the game and the arch nemesis of the rest of the line, at the same time as being one of the main Robot Masters, which was a nice little twist on the formula. At the same time as this, female Dr. Juniper went missing and male Dr. Juniper followed her and disappeared as well. 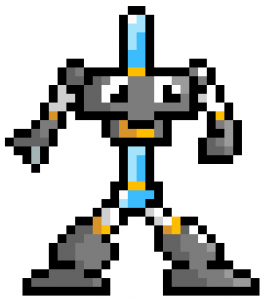 The robots were left on their own to fend for themselves against Castle Man, who they eventually lost to, falling under his influence and starting the events of the game. There was a lot to it, like Hydro Woman and Split Man being together, Race Man and Vine Man being best friends and Castle Man being that big evil guy who was evil for the sake of it. 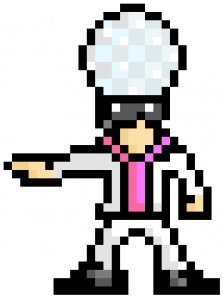 All of the characters were going to playable and each would have their own special abilities and all that, like Vine Man being tanky as all hell or Disco Man being super fast at moonwalking. This is still the plan. One problem arose, though, and that was music. I have got some experience in music, having played the piano since I was a small child, but I couldn’t compose, nor could my coder, nor could my girlfriend. So, it was Damien to the rescue, because he joined our little development team and contributed his amazing musical talents. He was quick, too, he madea whole bunch of amazing songs within the first few days of joining us. But this introduced another problem. Nobody knew how to chiptune or arrange properly. So it was up to me to take that job. I was a newbie piano arranger back then who had only written three scores beforehand. 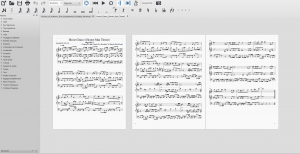 My best experience with arrangement was Minecraft Note Block Studio which I had been tinkering around with for months beforehand to create a couple little midi piano arrangements to listen to. That was fun, but I really needed to learn the more important stuff, which I did. Over the course of late 2015 to now I ended up making almost exactly 100 piano arrangements ranging from the main series, to shovel knight to our very own fangame songs. (most of which you can listen to here: https://soundcloud.com/codster-seventy-six). 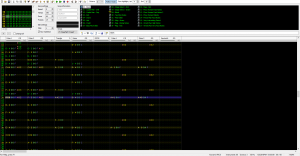 I later learned how to chiptune from a really amazing set of tutorials by Ben Burnes on YouTube. His tutorials are some of the best for famitracker that I’ve seen. Look him up if you want to learn. While I’ve been doing it for a few months now, I’m still in my major learning stage, where I’m trying to practice and teach myself everything I possibly can. 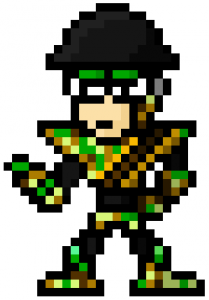 After a while, my coder friend stopped working on the fangame, then he eventually had to leave our development group. Don’t worry, there was nothing bad between us, we’re still pretty good friends, in fact. But he wanted to focus all of his efforts on schoolwork, which I can fully understand. I’m going through the same schoolwork he is right now, but I’m pretty sure coding takes quite a bit more effort and consistency than everything else. We were stuck with no coder, but Damien, my girlfriend and I still persevered with our art and music. As 2016 rolled around, progress was slow, but it was happening. Writing was being done, the character designs were being finalised and the music department was going strong. At the time my story writing and drawing skills weren’t as practiced as they are now, so the story was kind of “meh” and my artworks had a bit to be desired. It’s kind of funny how I’m talking about this as if it was so long ago, but it really feels like that. Plus, it was only recently that I started kicking into gear and getting much better at doing everything. But by mid 2016, around the time of my girlfriend’s and my first anniversary, she decided it would be a good idea to dump me in favour of someone she’d recently met. She did and said some pretty awful things to get rid of me, even though I did everything in my power to do everything as well as possible for her over the past year. She had the nerve to still want to continue this project with me, saying it was the only good thing to come out of me. I wanted to tear this project apart myself for the longest time because of this. The rest of what happened between us will remain undisclosed, since this is an official development blog, not a personal vendetta diary. So it was just me and Damien, and it was because of Damien that this project lived. He convinced me to continue and work with what we had left. So thanks, Damien, for when you read this. Not everything about this was bad, though, because this opened up the opportunity for the project to expand exponentially. Now that we had full control over everything aspect, we could plan accordingly and rewrite everything to an objectively better level. So, we worked with what we had, we rewrote the characters, replaced the old ones, made new songs and created a new story to a grander scale than the last. 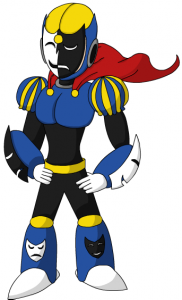 No longer was Castle Man an evil guy who was evil for the sake of it, but a caring brother, who was once greatly respected, but turned his back on his family to create an ideal world, and Split Man was a broken leader with memories of the scrapped characters and past events. The Organisation and Crimean Militia and many, many characters were introduced. The story ended up being at such a scale, that it is currently in the process of becoming a standalone text story to go alongside the game to give more context on the characters and settings. That’s pretty much the point we’re at right now, Damien and I being a two-man armyout to create this game. There is a potential coder coming to join us soon, but we’ll still have to see about that.